Good morning my lovelies! Oh, I have been so excited about this for weeks now... but at last it is here, my wee interview in the latest edition of UK Handmade magazine, yay! The ever so lovely Emily Parkes, a features writer for UK Handmade, got in touch a wee while ago and asked if I would be interested in doing a wee piece with her for the winter issue... well I couldn't say yes fast enough! 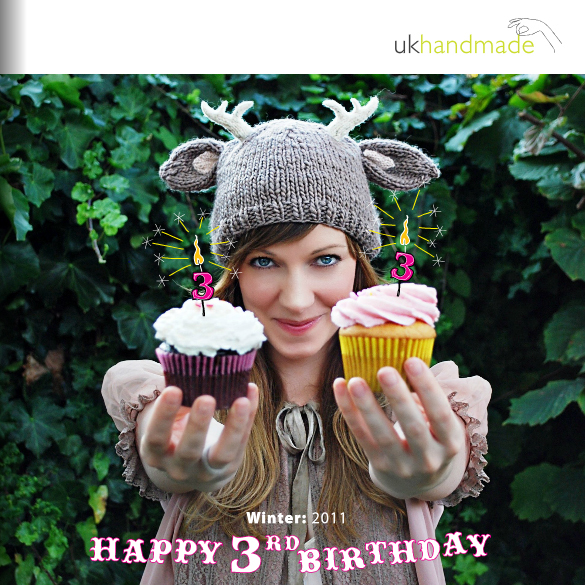 I love UK Handmade, it is such a great site with a great team behind it that are doing everything they can to bring together UK designer makers with small, independent brick and mortar shops and online boutiques. Each season they pull together a must read online magazine showcasing some incredibly talented designers; they run regular articles on their main site featuring inspiring finds, craft profiles and meet the maker pieces... and they have a very easy to use forum section where designer makers can customise their own page to showcase their work and connect with like minded artists. Really, there is so much going on over there, that if you are a UK based crafter or designer you really need to check it out! So if you are looking for a wee spot of lunchtime reading, I would love to know what you think of my wee interview and the magazine in general!? If you love this winter issue as much as I do then I know you will the previous editions too, you can find them listed underneath the current issue. A great wee feature, congrats Emma! Very nice! Congrats on the interview. Thanks for featuring this magazine, I hadn't seen it before. Congratulations on your article!